The tide was very early this morning. It was not dark when I pushed the boat off of the trailer but only because it was June. 4:45 Am and only 43 degrees with a rising easterly wind. 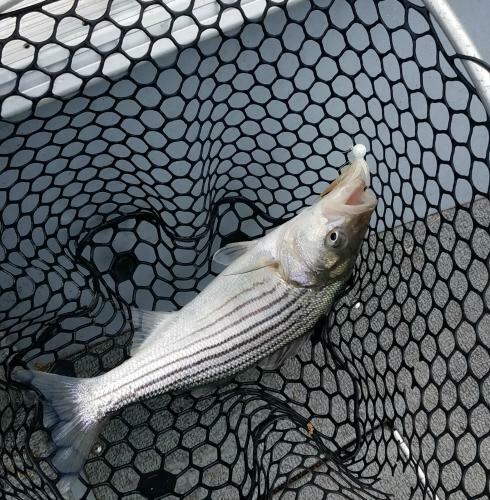 The plan was to do a quick look around for any stripers that might be in the river. After a futile first hour I found a nice pod of fish the one in the picture being the first willing to play and the smallest of the morning. After that I found more in several other unlikely spots for this early in the season. With several fish to the boat, almost frozen and proud that I had thought to build a fire in the woodstove at home before I left; I loaded and headed home well before the rain started. Another saltwater fishing season is now officially started at Maine Outdoors!